When dealing with new construction for existing home additions, the First Alert® OneLink® “Bridge” unit (SA520B) is a perfect solution. It is often difficult to connect to the existing alarm circuit when dealing with home additions. Concrete, steel, laminated beams, etc. are blocking easy access. Building codes state that the alarms must be hardwired for power, but do not have to be hardwired for interconnect. Therefore, the SA520B can be used in the new addition, where power can be obtained locally from a lighting or outlet circuit. In the existing part of the home, just replace one of the existing hardwired units with the SA520B. Link the two alarms to “bridge” the old and the new sections. 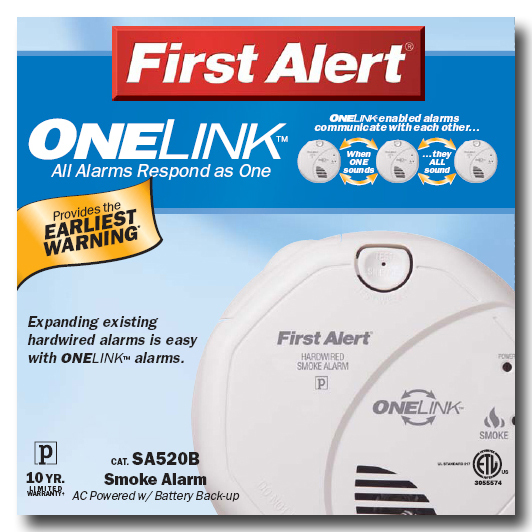 Now all alarms will be interconnected, including other existing hardwired alarms that were interconnected in the old section.